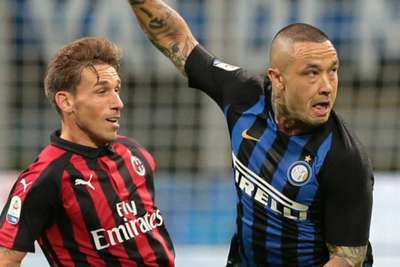 Lucas Biglia was surprised the VAR was not used to review a clash between himself and Radja Nainggolan during the Milan derby. Biglia was booked for a tackle on Nainggolan in the first half of Sunday's Serie A clash, which Mauro Icardi settled with a late header. But replays indicated Nainggolan was perhaps fortunate not to be punished as he caught Biglia heavily in the incident. Nainggolan was subsequently replaced by Borja Valero with Luciano Spalletti indicating the midfielder could be out for "a while" after damaging his ankle. The former Roma midfielder is therefore unlikely to be fit to face Barcelona in the Champions League on Wednesday. Biglia, though, defended his role in the clash and suggested the VAR may have judged Nainggolan more harshly than referee Marco Guida. "I have nothing against Nainggolan, it's a game, it can happen," the Argentina international said to Sky Sport Italia. "I just went to close down the pass. I showed them afterwards that my ankle and knee were not in good shape either. "It's not up to me to judge, it's for the referee. Perhaps the VAR should have paid closer attention and I expected them to look at it. "I went to speak to Radja afterwards, it was not a nasty tackle at all. He told me his ankle was swollen and I said it wasn't easy for me to play for 70 minutes like that either, especially with a yellow card." For the second season in a row, Icardi settled the derby by scoring late, the Inter captain having netted a hat-trick in this fixture last term to down Milan. Icardi headed in a right-wing cross from Matias Vecino that deceived teenage goalkeeper Gianluigi Donnarumma to score his sixth goal in six Inter games. "It hurts, certainly," Biglia added. "I don't know if Inter deserved to win. "They had more possession, but didn't create many chances and we made a mistake at the end."